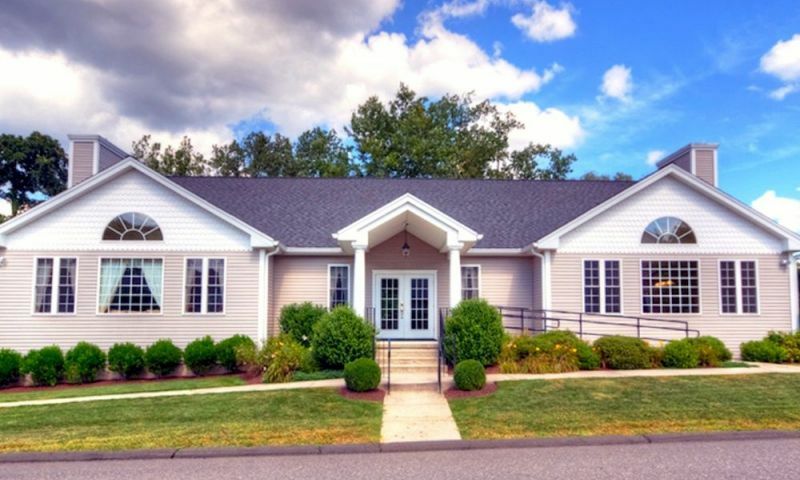 Pond Spring Village is a 55+ community in the charming town of Beacon Falls, Connecticut. This intimate active adult community consists of duplex homes and a clubhouse. The community is centrally located from the downtown area of Beacon Falls and is in close proximity to other major cities as well as hospitals, state parks and recreation. Active adults can enjoy the scenic beauty of Pond Spring Village because it is surrounded by open rural space and offers breathtaking mountain views. Active adults at Pond Spring Village can enjoy the amenities provided by the beautiful clubhouse. The clubhouse is a great social gathering space for homeowners to relax, mingle with other neighbors, or have some fun. Residents can hang out and play cards in the multi-purpose room, host a group discussion in the gathering area, make a quick snack for a potluck party in the catering kitchen, or shoot some pool at the billiards table. There is also an outdoor deck and BBQ area as well as beautiful walking and biking trails that intertwine throughout the community. Homeowners can appreciate the scenic views of the mountains and natural space along their daily strolls of this picturesque community. Construction at Pond Spring Village began in 2005 and it will consist of 92 duplex homes upon completion. Homebuyers can choose from four floor plans that offer spacious living areas, hardwood floors, eat-in kitchens, nine-foot ceilings, large master suites, and walk-out decks. These duplex homes offer 1,294 to 1,420 square feet of living space and feature one to two bedrooms, two bathrooms, and an attached one to two-car garage. Residents aged 55 and better have plenty of things to do at Pond Spring Village and it doesn t involve any yard work. The homeowners association (HOA) takes care of mowing and lawn care, insurance and management, snow removal, common area maintenance, and garbage pickup. Active adults have more time to participate in social activities at the clubhouse and hang out with other neighbors. Pond Spring Village is a socially active community that offers residents clubs and activities, such as men s pool, men s weekly breakfast, book club, bingo, billiards, social night, picnics, pasta night, ladies luncheon, Friday night social, Mah Jongg, and so much more. Residents are sure to have a busy social life while living at Pond Spring Village. Centrally located in the scenic town of Beacon Falls, CT, active adults have easy access to downtown Beacon Falls as well as close access to Metro-North train lines, Interstates 95 and 84, and Merritt Parkway. Residents seeking farther attractions can drive to Danbury or Hartford, which are about 45 minutes away, and New York City is about 68 miles away. Homeowners also have a variety of options to choose from when it comes to the area s state parks, hospitals, and theaters. Active adults can enjoy living in low-maintenance homes in a quiet setting at Pond Spring Village in New Haven County, Connecticut. There are plenty of activities available in Pond Spring Village. Here is a sample of some of the clubs, activities and classes offered here. These duplex homes offer 1,294 to 1,420 square feet of living space and have one to two bedrooms, two bathrooms, and an attached one to two-car garage. They feature spacious living areas, nine-foot ceilings, hardwood floors, large master suites, eat-in kitchens, and walkout decks. I moved here a couple years ago from my big 2-story home. It was hard to downsize and I was concerned about buying a duplex but it's been great. My son and his family live near Hartford so it's not that far of a drive to visit. The neighborhood is quiet and the people have been great. I use the clubhouse a few times a week and love how light and bright it is. Moving here was a great choice! 55places.com is not affiliated with the developer(s) or homeowners association of Pond Spring Village. The information you submit is distributed to a 55places.com Partner Agent, who is a licensed real estate agent. The information regarding Pond Spring Village has not been verified or approved by the developer or homeowners association. Please verify all information prior to purchasing. 55places.com is not responsible for any errors regarding the information displayed on this website.